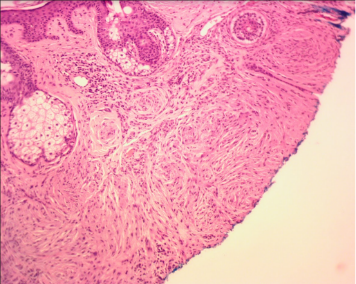 87-year-old man with underlying scleromyxedema and history of multiple basal cell carcinomas presents with a left earlobe nodule. Biopsy revealed this to be a lesion with benign spindle cell proliferation in vague concentric whorls with associated dermal fibrosis and chronic inflammation. 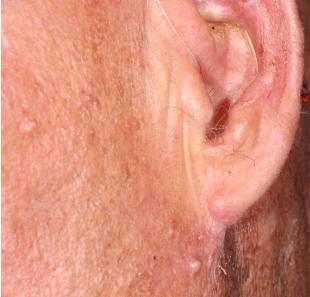 This was a typical scleromyxedema lesion presenting within the fatty earlobe and not superficially as his other visible lesions. Fig. 1. Left cheek nodules characteristic of scleromyxedema. Left earlobe nodule described above. Fig. 2. 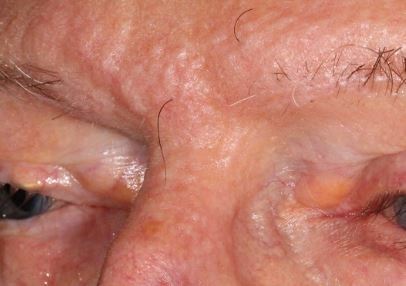 Classic papular beading in the forehead glabella in a scleromyxedema patient. Scleromyxedema is a rare chronic cutaneous fibromucinous disorder with 1) generalized papular and sclerodermoid eruption; 2) mucin deposition, fibroblast proliferation, and fibrosis; 3) monoclonal gammopathy, but no thyroid disorder. It has a chronic progressive course with a high mortality due to pulmonary complications. It can be treated with chemotherapy, steroids, and stem cell transplantation. From a dermatologic perspective, the severe skin fibrosis and inelasticity impedes routine skin flap mobility. Skin graft revascularization is also impacted by fibrous hypovascular subcutis. Secondary intention healing in some cases is the best alternative for skin defect management. For more on this disorder, see this open article in JAMA Dermatology. Successful Treatment of Scleromyxedema With Autologous Peripheral Blood Stem Cell Transplantation. Fig. 3. Scleromyxedema skin histology showing benign spindle cell proliferation in vague concentric whorls with associated dermal fibrosis and chronic inflammation.